— This article by Jerry Cates and Katie, first published on 19 February 2010, was last revised on 23 April 2016. © Bugsinthenews Vol. 11:02(08). 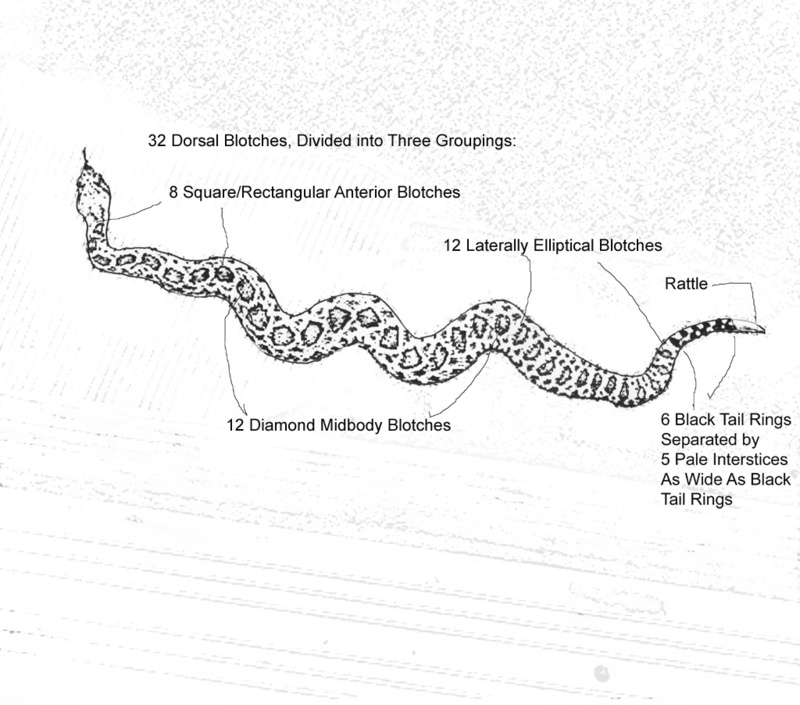 Line Drawing of Katie’s Rattlesnake, showing visible anatomical features. We set up an appointment for the afternoon, and then she and her husband met me at her home to examine the yard to see if we could figure out why rattlesnakes were showing up there. This home is in a typical residential neighborhood. It is surrounded on all sides by homes, and across the street by a large, well-maintained apartment complex that was constructed within the past two years. One might assume that such a neighborhood would be an unlikely habitat for rattlesnakes, but no, such sightings are not all that unusual. Before we set out to reconnoiter the yard together, I was pleased to learn that a landscaper had been called in, and would be visiting the home tomorrow. They already knew the yard needed some work, both to remove some of the rock and other debris, as well as to take out some bushes and a huge vine that covered one of the privacy fences in the back yard. The family has lived here for over four years, and–with three boys who love to climb and dig and rough-house, it isn’t easy to keep a yard manicured, especially when nobody realized that venomous snakes were lurking nearby, ready to take advantage of the excellent habitation resources that a rough and somewhat cluttered yard provides. We looked around and confirmed that a considerable amount of work needed to be done to make the yard less attractive to snakes and rodents. In particular, a gap between the concrete patio and the home, which originally had been filled with a wooden expansion board, needed to be filled with sand. The landscaper would do that in a few days. Then all the clutter in the back yard needed to be removed, and a pile of rocks next to the home on its left side needed to be removed. I was particularly concerned about this pile, because it showed signs of animal activity, with small, clean holes in it that would provide excellent ingress and egress for snakes. The next day (January 22, 2010), in the afternoon, we started on some of the first steps of that project, which were to spread an essential plant oil granule around the perimeter of the yard, under the playhouse, on the rock pile, into the gap between the patio and the house, and around the shed. Then we sprayed a liquid spray on the rock pile, and in the patio gap. The neighbor next door, who had seen snakes in their yard, asked for the same treatment and that was carried out at the same time. I left, and asked Katie and her husband to keep me posted on what the landscaper found (suggesting, of course, that they make sure the landscaper was prepared to deal with rattlesnakes if one or more were found during the cleanup). 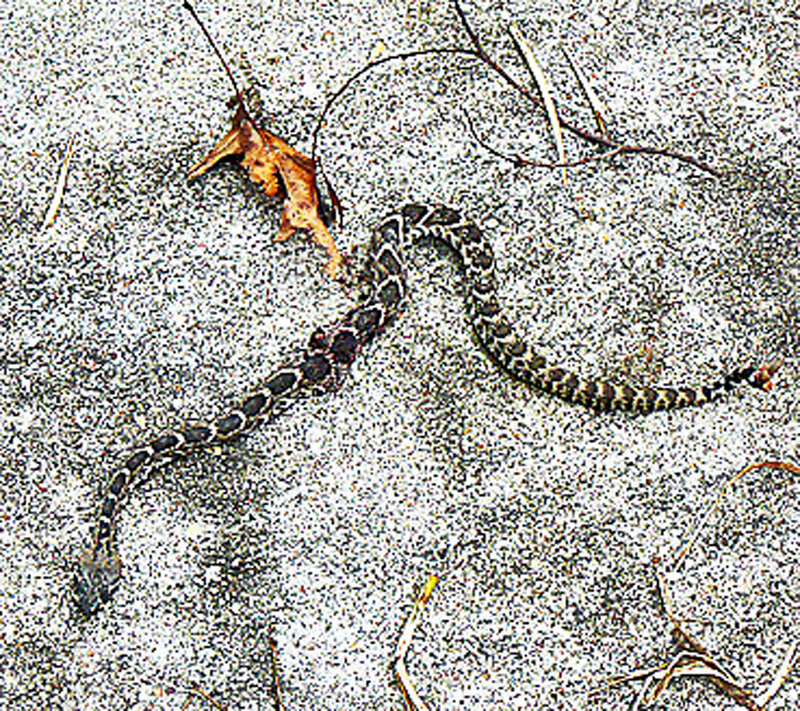 On 2 February 2010, Katie sent the photo shown here, of another rattlesnake that the landscaper found that day while clearing the rockpile next to the house. 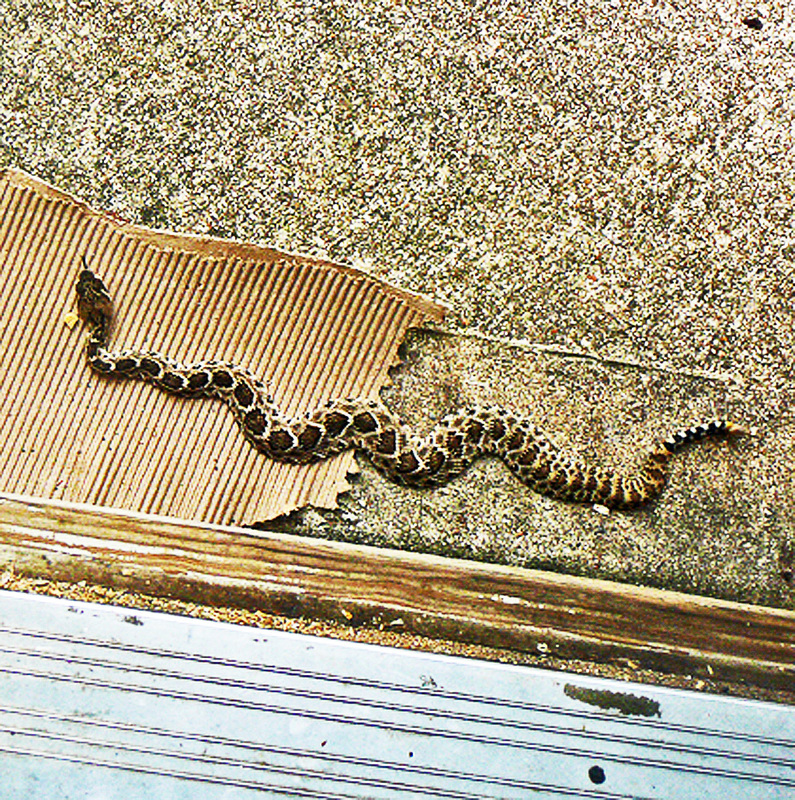 It was larger than the snake that had been seen on January 21. Although finding this snake was disconcerting to this family, it clarified the importance of removing all the debris that provide habitat for these snakes from their yard. Now that project is complete, the constant job of keeping the grass mowed and watching to make sure the other places where snakes can reside (under the shed, and under the playhouse, for example) are inspected carefully but frequently, must be kept up into the future. The essential plant oil granules and sprays used for habitat modification purposes (as part of an IRIM P.A.™ program) help create an environment that does not attract or nurture snakes, but using these products alone is not a guarantee against incursions by these creatures. Just as important is (A) physical modification of the environment, which this family has done by having clutter and rockpiles removed, and (B) frequent inspections of all places where snakes can reside. Doing all these things together will, over time, leads to a marked reduction in the risk that this home will have another rattlesnake sighting. If they relax their vigil, let the grass grow too high and debris collect, another sighting and possibly a nasty snake bite, may result. — Questions? Corrections? Comments? BUG ME RIGHT NOW! Feel free to e-mail jerry.cates@entomobiotics.com. You may also register, log in, and leave a detailed comment in the space provided below.